A job offer is exciting. It can mean new opportunities, more money, a move to a new city or state, and a big promotion. But wait just a second. Before you hurriedly take that offer and sign your name on the dotted line, you need to ask the following 12 questions. They can be the difference between a good job, a great career, and a position you don't actually want at all. Remember, with a job offer, the ball is in your court. They want you. You hold the power, and you should make sure you get exactly what you want. 1. How Many Vacation, Personal, and Sick Days Do I Get? You cannot assume you will get the same vacation package you got with a previous employer. In fact, if you are moving to America from another country, you may be in for quite a nasty surprise. For instance, the UK mandates 28 days of paid vacation every year, and this does not include public holidays. There are no such rules in the U.S., and most people are lucky to get 10 paid vacation days per year when starting a new job. So, ask, and see if it's negotiable. You also want to find out if these allowances increase over time. Some employers will add an additional five paid days after three and five years of continuous employment. Or, paid days off may increase with a promotion. You also want to ask about personal days, which have different conditions than vacation days (personal days may not be allowed to carry over). Is there a maximum amount of days that can be carried over before you stop accruing? These will all be outlined in the contract you sign, but you want clarification long before it is printed up. 2. What's Included in the Benefits Package? Benefits cost employers a great deal of money, and so they are seen as a big incentive when hiring a new employee. The biggest cost is health insurance, and there will be options there, too. Some employers have a sliding scale of insurance options, including HMO, PPO, EPO, and HAS plans, and all will cost different amounts and have varying degrees of cover. Aside from health insurance, ask about other kinds of insurance, too. Are vision and dental included? Is life insurance included, or long and short-term disability? These options, if offered at no charge to you, can add up considerably to the basic pay package you are being offered. This is why a site like Salary.com will list base salary, and salary plus benefits. The latter can be a lot more. And if there is a bonus, ask about that. How much, what do you have to do to get it, and when is it paid? 3. What's the Parking Situation? Parking can be a big deal in some cities, especially New York and L.A. If the company has a lot set aside for employee parking, you're usually in great shape. Is the parking offered close to the building, or is it quite a walk? Your personal safety may be an issue here. If you have to find your own parking, things can start getting tricky, and costly. Does the company cover employee parking costs, and if so, how much do they cover? For instance, you may be covered for street parking, but not a covered lot, and if you are worried about hail or other weather conditions, that can be a deal breaker. Does the company have a discount plan on public transportation? This can be a better option for some, as parking and gas money can be too expensive. 4. What Are the Actual Hours? Depending on the industry in which you work, this can greatly impact your hourly wage. If you are offered a starting salary of $60,000 per year, and work 40 hours per week, you're getting roughly $29/hour. If you work 60 hours per week with no overtime, that drops to less than $20/hour. So, ask for realistic working conditions. If you are going to be stuck in the office nights and weekends, you may want to negotiate your base pay, or ask for additional vacation and personal days. Your hiring manager may paint a very rosy picture of the conditions, so ask people whom you'll be working with. Be informed. You do not want to find out you just quit a $50,000 job working 40 hours per week for a $60,000 job working 60 hours per week. 5. When Am I Expected to Start? It may seem like a no brainer, but some people get bitten badly by not asking this question before accepting the job. Then, they're in sticky mud when they realize the start date is too far away to make ends meet, or too soon to allow relocation, or finishing up a position at another firm. Although most employers will give you two weeks, it's possible you need more time than that to get your affairs in order. If you're moving across the country (or from another country), it can take months to find a new place and get situated. On the other hand, it may be that the position needs to be filled immediately, and your contract with your current employer demands two weeks' notice. Whatever the conditions, you need to know the start date. You can always negotiate coming in later, or earlier, or it may be that you cannot accept the job at all based on the start date offered. You do not want to find this out after you have resigned from your current position. 6. What Are the Promotion Opportunities? In a fantastic episode of The Office (UK), Tim says "It's better to be at the bottom of a ladder you want to climb, than halfway up one you don't." This is very good advice, and something you must keep in mind when you are considering the new job. You may not be happy at your current job, but there may be more promotion opportunities than at the company you're thinking of moving to. Even worse, you may find out that it is impossible to get promoted out of the department you're applying for. Suddenly, you have gone from climbing a ladder, to hitting a glass ceiling. So, examine the organizational structure (ask for a company org chart if you can). See who is above you, and below you. Find out how quickly you can get promoted if you work hard. It may be that the starting salary is not ideal, but that the opportunities for promotion are excellent. And of course, the reverse may be true… you do not want a job that pays well now, but goes absolutely nowhere. 7. Will There Be Considerable Travel Involved? For some people, travel is a perk that they cannot wait to take advantage of. For others, travel means valuable time away from family and friends, and the hassle of living out of suitcases and hotels. Wherever you stand on this, you should know beforehand what the travel expectations are. Some jobs will actually list it in the ad (20% travel required). Others will play it by ear, but tell you that some travel each month will be happening. On the other hand, some will tempt you with travel opportunities, but they are empty promises and you will actually be chained to your desk, year in, year out. Get this knowledge up front. Can you talk to the person you are replacing? What was their specific experience of travel like? If you enjoy traveling on the company dime, and walk away from a job that gives you such a benefit, you want to make sure you are getting it from the new position. 8. Is There a High Turnover Rate Here? A revolving door is not a good sign, and if people are constantly leaving, that is a sign of systemic issues plaguing the company. Usually, the biggest reason for high turnover is poor working conditions. This could mean very long hours, oppressive management, favoritism, low pay, or the lack or promotion opportunities. The company could also have a history of hiring and firing people on demand for projects. Whatever the reason, high turnover is a huge red flag. The hiring manager may well be reluctant to give you this information, so ask other employees. Or better yet, take a look at Glassdoor.com and see what former employees are saying. If there is a pattern there, especially for harassment or abuse, you know what to avoid. 9. What Is the Onboarding Process Like? Onboarding is a buzzword term that means "the mechanism through which new employees acquire the necessary knowledge, skills, and behaviors to become effective organizational members and insiders." In short, how long you will be given to get up to speed on the job, the daily duties, and the projects you are given. If they are going to give you extensive training and a grace period, that's worth knowing. If they expect you to hit the ground running, you need to know this beforehand. You do not want to take a job for which you are not yet qualified if they expect instant results. That will show quickly, and you could be laid off after a month or two. 10. What's the Company Culture Like? Is it a fun place to work? Is there a strict dress code? Is there a great social life outside of the office? Are the hours somewhat flexible, or do you have to be there exactly at 9 a.m., and leave at 5 p.m.? Is lunch a strict one-hour affair, or is there wiggle room? Are there office parties, and gift exchanges? Is the office full of cliques that make it difficult to fit in and make friends? You want to know as much about the culture as you can. You spend more time at the office than you do at home, so it should be a place you enjoy working at. 11. Who Will Be My Supervisor? A name is just a name if you're new to a company, but you can easily research that person with the availability of information on LinkedIn and social sites. Is it someone who is a go-getter, driven to get results, with high expectations of every team member? Is it someone with a lot of experience that you can learn from, and grow? Is it someone who hates competition, especially from subordinates? Find out who you will be reporting to, because a bad manager is one of the biggest reasons people quit their jobs. 12. Where Will I Be Working? If you're taking a position as a mechanic, you're working in the garage. But if it's an office job, this could make a big difference for you. Right now, you may have an office, and the new job comes with a cubicle, or a desk in an open plan facility. This could be a deal breaker. Do you have a window? Again, for some people it's not important, but for others, natural light and a view is a must. If you can, ask to see the space and if it's not good enough, ask for something better. You want to get this nailed, possibly in writing, before you start. 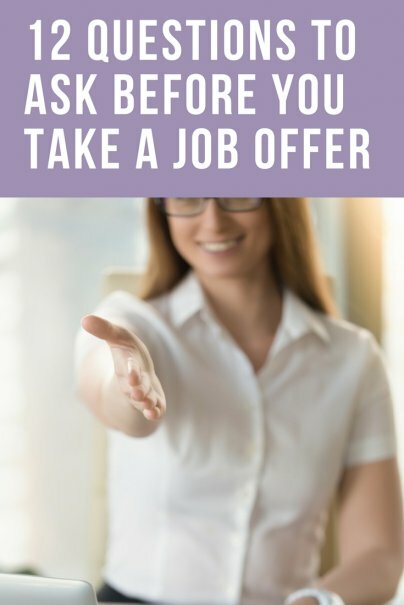 What other questions should you ask before taking a job offer? Share with us!